There is so much to do when you’re preparing for the holiday season. From decorating and baking to shopping and wrapping, it can all get overwhelming. 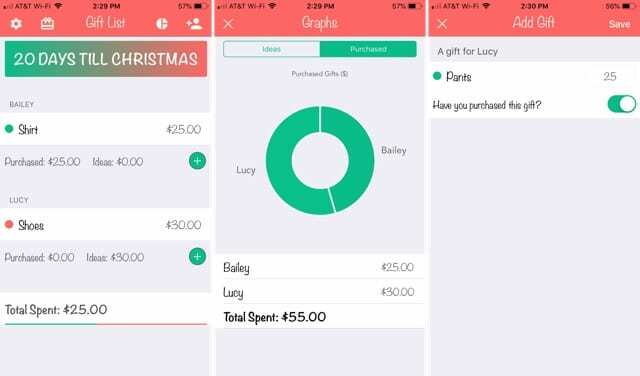 To ease that load of holiday tasks, check out these handy gift list apps for your iPhone. They let you quickly make your list, include helpful notes, and stay completely organized with all of your holiday shopping. 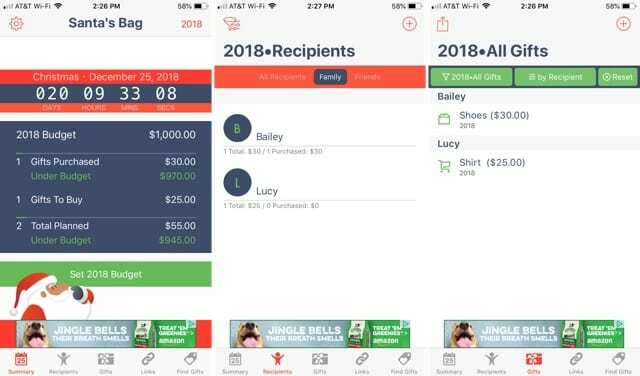 Santa’s Bag is a terrific gift list app with a host of features that you’re sure to find useful. Start by adding a year or list and budget so that you can track what you’re spending. Next, add your recipients which are grouped for you already by friends and family. Then, pop in your gifts and you’re on your way. Enter recipients manually or import from your contacts. Add gift details including list, recipient, store, price, quantity, location, and tags. You can also mark if the gift is homemade or a stocking stuffer. Track gifts through the process by tapping whether it’s an idea, planned to be bought, ordered, ready to wrap, wrapped, needs to be sent, or given. Use the Links section for gift ideas, tags, wish lists, and registries. Check out the Find Gifts area for gift ideas by category or merchant including stores like Amazon, Best Buy, Macy’s and many more. Santa’s Bag is super easy to use, gives you a number of great features, and shows you a nice summary on the main screen of gifts planned and bought. As a bonus, you can also see a cool countdown to Christmas. Santa’s Bag is free with an in-app purchase to remove the ads. 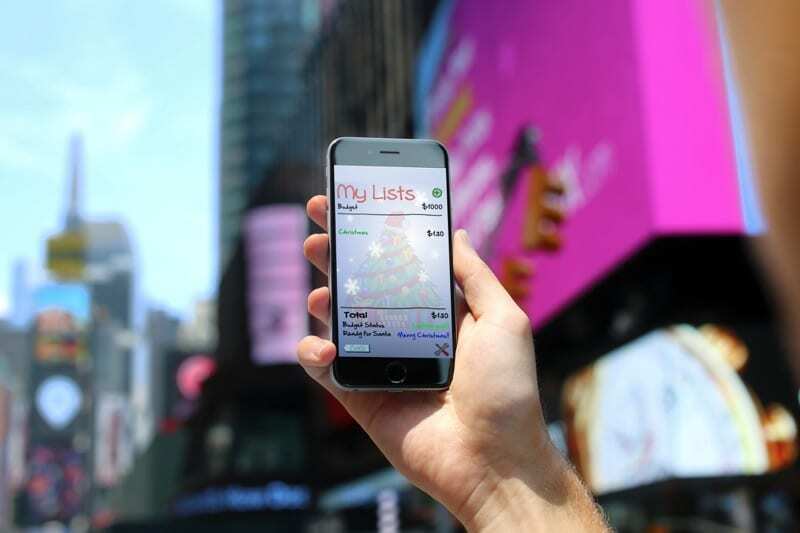 The Christmas Gift List Lite is another good gift list app to try. You can jump right in and start adding your recipients and gifts, each in their own convenient sections. You can also adjust the settings to show cents, select a currency type, and use a passcode or Touch ID. Enter recipients manually or add from your contacts. Include a budget for each recipient and see how much you’ve spent and have left for them. Add gift details such as store, price, recipient, and a note. Track gifts through the process like idea, need to buy, purchased, shipping, received, wrapped, and presented. Sort gifts and recipients by where their gifts are in the process. The Christmas Gift List Lite has a festive interface and also includes a countdown to Christmas that you can change to New Year’s if you like. The progress screen gives you a nice overview of your budget and gift tracking by the person or present. The Christmas Gift List Lite is free with an in-app purchase to remove the ads, sync across devices, and archive lists. GiftPlanner is one more excellent gift list app to check out. What’s nice about this one is that you can add multiple lists or events. So, you can use the app any time of the year. Add your event, include a budget, and then start planning those gifts. Include recipient details like their birthday, anniversary, interests, favorite color, address, and more. Add gift information for price, quantity, store, website, and notes. You can also add an order number, tracking number, and shipping company for those deliveries. Track gifts through the process like idea, purchased, ordered, received, wrapped, and given. Set up a passcode with Touch ID to keep your gift lists private from prying eyes. GiftPlanner lets you stay on track with your shopping with a nice overview of each event list and where the gifts are in the process. Plus, you can email an event report, so shopping with another family member is that much easier. GiftPlanner is free with an in-app purchase for device syncing and extra event icons. 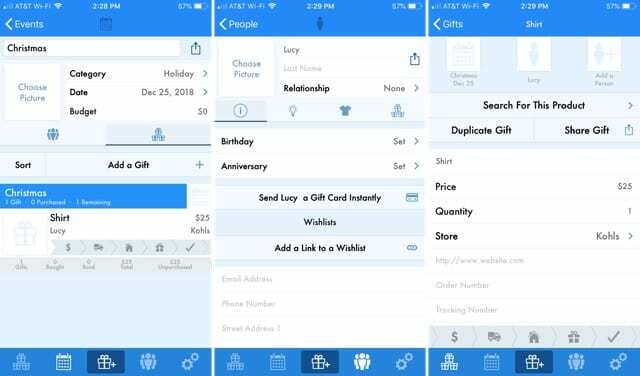 If you don’t need a ton of extra features and just want a basic gift list app, take a look at Christmas Gift List Tracker. Add your recipients, enter their gifts, and that’s it! Add each recipient with just their name. Tap to add a gift for a recipient that includes the price and whether or not it’s been purchased. See a running total of what you have planned and purchased for each recipient. Check out the easy-to-read graph of ideas and purchased gifts per person. Christmas Gift List Tracker doesn’t have as many features as similar apps, but sometimes simple is the best way to go. So, if you want a basic gift list app with a clean interface, then give it a try. One more simple gift list app to take for a spin is Gift It. 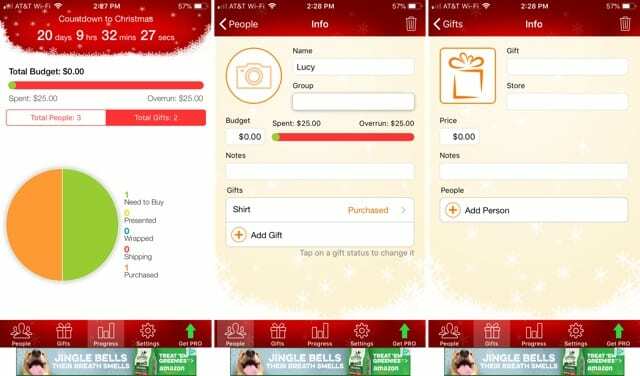 This app is ideal for those who only shop for one or two people or want an app for other holiday shopping items like food or decorations. Create one or more lists and enter your budgets. Add a gift and its price. Swipe to mark items off the list and send them to the bottom or the Purchased section. See a quick view of how much you’ve spent of your budget. Gift It is a colorful and cute gift list app that’s perfect for smaller lists. 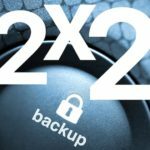 It’s available for free and you can upgrade via in-app purchase if you would like password protection and ad removal. Anything that can lessen the amount you have to do for the holidays is a help. That’s why these handy dandy gift list apps are so useful. Track your budget, your recipients, your gifts, and stay organized this season.